With the goal of increasing crop yields, a robotic flyer has taken to the air at Aerofex. 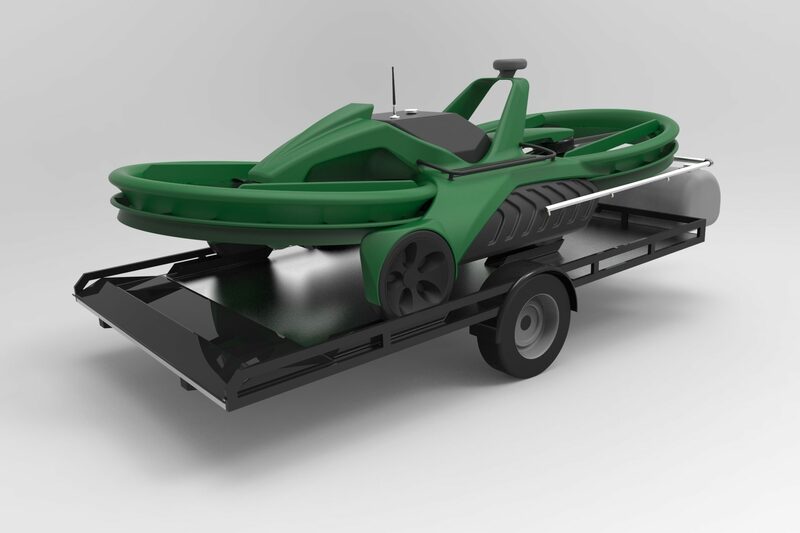 Designed specifically for the precision spraying of crops, its size and lift enables significant capacity for fertilizer, pesticides, and fungicides. Rendered here next to the manned testbed, it shares the same control system, lift-train and ducted fans of its predecessor – allowing safe operations around ground personnel and obstacles. The platform’s ducted fans eliminate the swirl caused by open wing tips and exposed rotor blades – a primary cause of drift. Its flight attitude and favorable downwash will place the input precisely where intended and below the canopy of the crop – increasing efficacy while protecting adjacent fields. Like the testbed, it is fueled by automotive petrol, enabling continuous use throughout the day with coverage rates in excess of battery powered UAVs. 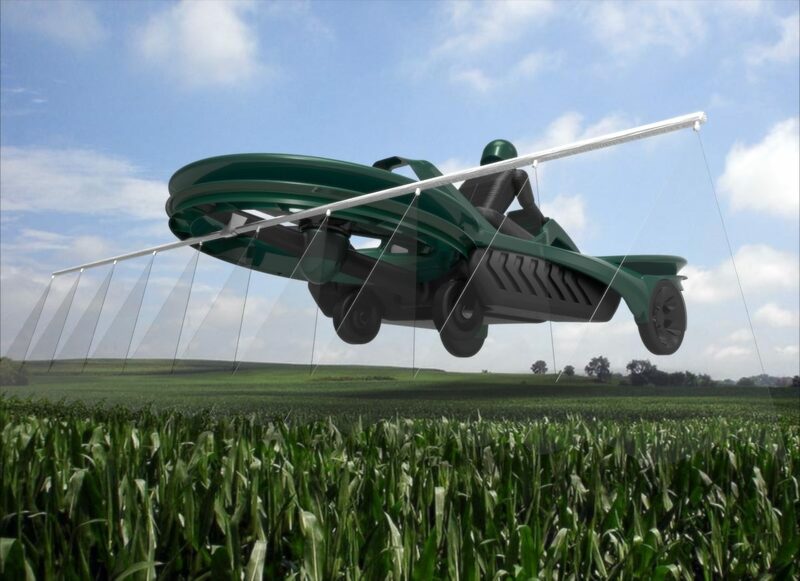 The aerial sprayer is constructed primarily of thermoplastic composites and high-performance plastics to withstand the rigors of the agriculture environment. It can be lifted by two men and transported in the back of a small pick-up truck. 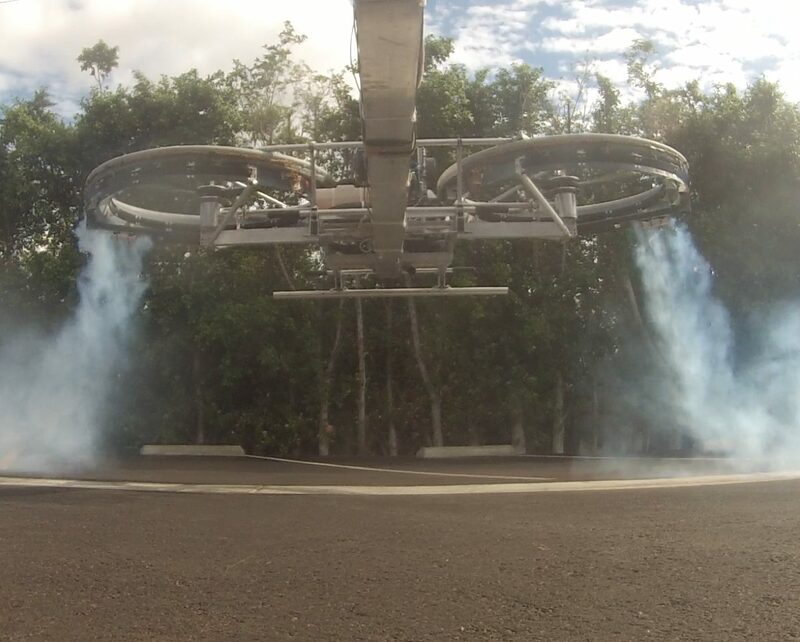 Aerofex has demonstrated its ducted-fan technology can tame the downwash of VTOL aircraft. It is designed to expand the downdraft and eliminate the recirculating flow typical of open-rotor craft. The enabler is the ejector system. The exposed blades of helicopters and multicopters generate tip-vortices and swirl. As captured in the first two sequences (go full screen), conventional craft create significant turbulence which leads to drift (clouds). The steady flow characteristics of the Aerofex technology shown in the latter two scenes reduce vortices and expand the downwash to lessen its energy. Why does this matter? For spraying crops the characteristics of the downwash are paramount. In manned applications, open-rotor swirl creates brownouts that risk injury to personnel and damage to the aircraft. 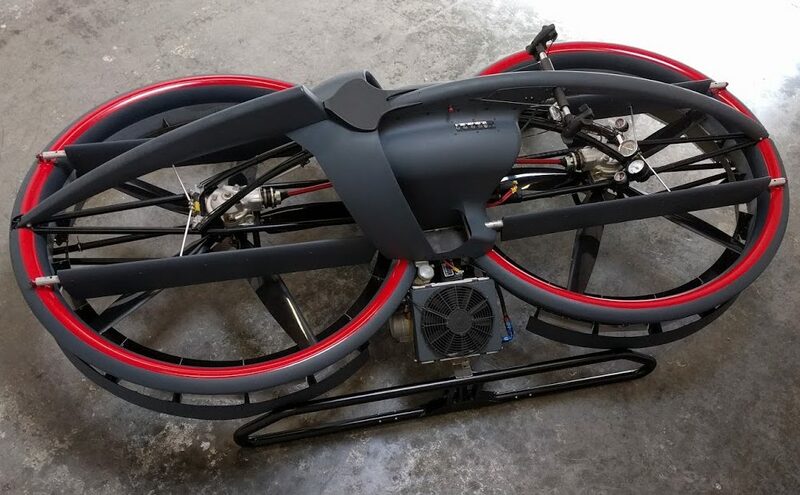 Perhaps not an “application” in the market sense, the use of our prototype as a test-bed does enable us to advance the technology behind the Aero-X and specific applications. We develop and fly any new sub-system for the Aero-X on the test-bed before incorporating it into the baseline design. Our second-generation prototype includes a re-engineered pilot interface that places all flight control functions in the hand-grips – pitch, roll, yaw and power. The design maintains the same level of intuition for the pilot and allows full control with only one hand – a necessity for useful flight. In addition, a redundant dual-string control system has been integrated, which provides stability augmentation. Also heading out to the test site for evaluation is a distributed landing gear that will enable us to test the effectiveness of downdraft manipulation devices for agriculture. For hosting industrial sensor payloads, an instrumentation package has been integrated to assess vibration levels and disturbances generated on-board the vehicle in flight. According to the International Red Cross, over 2,000 people a month are injured or killed by unexploded ordnance and landmines (UXO). Sites contaminated with UXO prevent civilian land use for agriculture or development. In the United States alone over 15 million acres may be contaminated by UXO. The US Environmental Protection Agency estimates UXO at 16,000 domestic inactive military ranges pose an “imminent and substantial” public health risk and could require the largest environmental cleanup ever. According to all estimates, remediation costs at suspect sites will exceed $15 billion. Private sector companies perform the remediation work through contracts from the US government. The US government currently spends $200 million annually on UXO remediation. The work is labor-intensive using current methods. It is estimated that 70-80% is spent on surveying, removing vegetation, transportation, and personnel to manually detect and map UXO with metal detectors. Other methods of mapping UXO include digital geophysics detection with ATVs or helicopters. The ATVs are limited in their capabilities, particularly in the littorals or overgrown environments typical of the sites. Helicopters are not cost-effective for the task and the very low altitude required by the sensors has been blamed for several accidents. Prior to this ruling, unmanned aircraft could not be operated for commercial purposes in US airspace – even over private farmland. The petition for exemption was opposed by several groups concerned about the risks of unmanned aircraft operating in national airspace. The FAA determined the risks could be mitigated, in this case, by limiting altitude and airspeed (400 feet AGL and 45 mph max). The ruling also spells out specific flight operating procedures, as well as fuel reserves and sensors required on-board the craft. Unlike autonomous drones, the exempted unmanned aircraft is piloted from the ground, with the craft in the operator’s visual line of sight. As a safety precaution the exemption requires the operator to possess a sport pilot rating at the minimum and be accompanied by a spotter in radio contact who must also maintain visual line of sight to the craft in flight. The ruling is significant in that it recognizes the value of unmanned aircraft to agriculture and establishes a framework for the expansion of aerial application by unmanned craft. The US joins Japan, South Korea and Australia in allowing the commercial use of an unmanned aircraft for aerial application. In support of two proposals recently submitted to potential partners, Aerofex has finished preliminary design of the Aero-X flotation gear. The floats provide a water-borne capability that will allow the platform to operate safely over water. 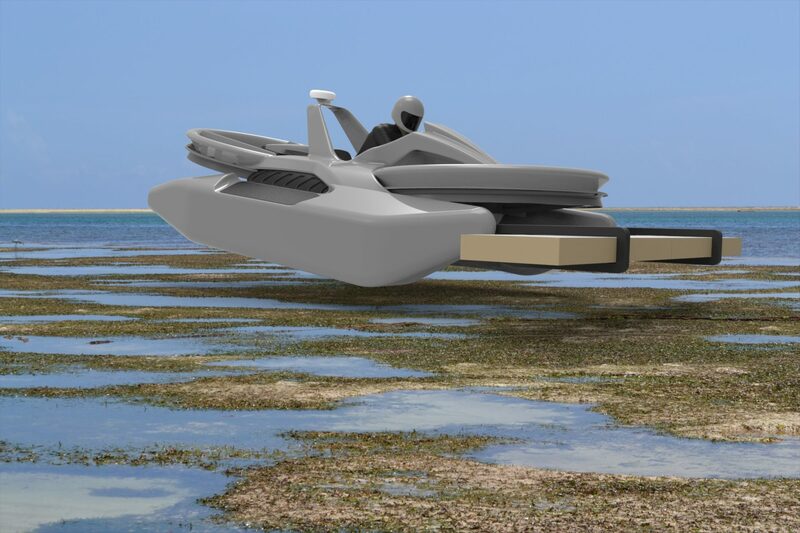 The over-water version of the Aero-X would be useful for ship-to-shore or ship-to-ship transport as well as traversing shallow water, rivers, or marshland – where other vehicles have trouble. 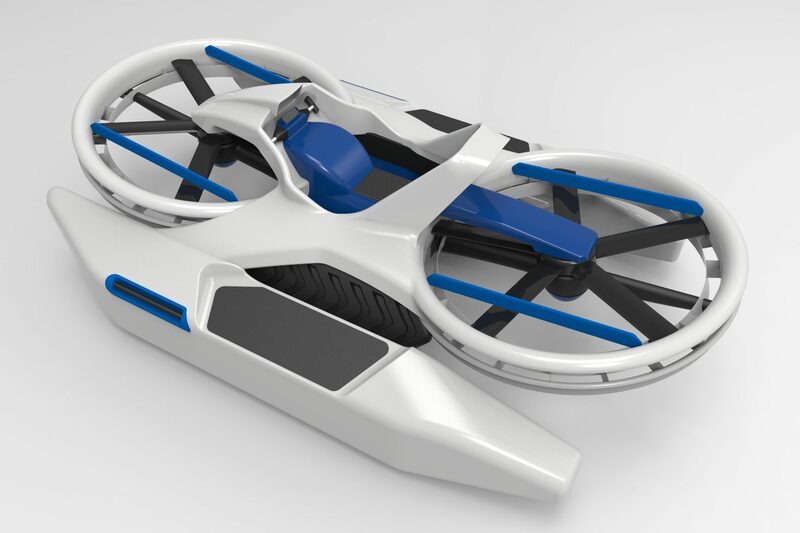 Designed to increase lift in ground effect, the water-enabled platform should have the same capacity as the Aero-X, but at reduced altitude – around 6-8 feet. We hope to test the gear early in the development process (the ocean is closer then the desert) – and report performance as we go. It looks to be a whole lot of fun. Mobile infrastructure mapping is the process of collecting geospatial data of structures and topography from a moving vehicle. Originally it was performed with low-flying aircraft carrying downward looking cameras or radar to map the topography of inaccessible areas. For many applications however, mapping from aircraft proved prohibitively expensive or lacked the accuracy required. The development of three-dimensional laser scanning systems brought a new capability to infrastructure mapping. 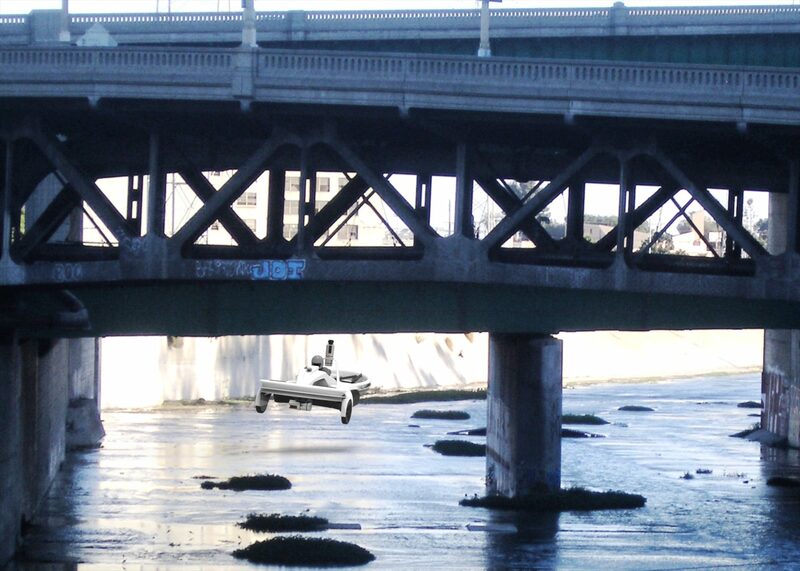 The accuracy of the data collected using laser scanners enables detailed comparisons of the position of structures – or the slope of river or road banks, allowing detection of shifts or movement over time. State-of-the-art laser scanners have become less costly and more accurate. Reductions in size and power have provided a portable capability that allows them to be mounted on automobiles. The combination allows rapid collection of accurate data for assessment of the surface and structures surrounding roads – which is their only limitation. Where there are no roads – for example in river basins or unimproved worksites, the Aero-X can accommodate two mobile laser scanners and their support electronics. One scanner is oriented for detailed mapping of the surface, while a second scanner mounted atop maps elevated structures such as guardrails, poles, and bridges. The top mounted unit has a video camera and both sensors share the same GPS system. In a single pass, data gathered after a catastrophe such as a flood or earthquake can be compared to that collected previously to rapidly assess which structures are affected and which can be put back into use. A question we are often asked regards the use of the Aero-X in agriculture. The concern is the force of the downdraft – and we think about it all the time. In aerial application, a certain amount of downwash is a good thing – it disturbs the crop canopy enabling the applicant to penetrate deeper into the crop. This is why helicopters are sometimes more effective than dusting the canopy with an ag-plane. However the coverage rates of purpose-built ag-planes cannot be challenged when time is critical. The velocity or wind speed is how the energy of a downdraft is characterized. As felt on the ground, downdraft velocity is proportional to the square root of the amount of weight lifted. It is inversely proportional to both the radius of the fans, and the square of the altitude flown above the ground. What this means is that altitude is the most potent term in reducing the downdraft. Of course, for aerial application we want to get as close as possible to the crop canopy, so let’s look at the other two factors; fan radius and weight. The larger we can make the radius of the fans, the lower the downdraft velocity. The Aero-X fans are as large as is permitted for transport over public roads by trailer. Repositioning on roads is a cost-effective enabler over craft that must be based at airports. That leaves the last term, which is weight. Through the use of composite materials and limiting equipment to only that required for low-altitude flight, we believe the Aero-X achieves the minimum weight possible for safe manned operations. When used for aerial application the intent is not to replace ag-planes. Instead the Aero-X will allow a grower to inspect crops and apply fertilizers, fungicides, and pesticides locally where they are needed – potentially avoiding or reducing full field spraying. The benefit of this approach reduces the weight of fuel and applicant carried – and the downdraft. Ducted fans are known to have flow patterns that will be beneficial to aerial application – the flow does not recirculate as from an open rotor or wing tip. We will be characterizing the downdraft of the Aero-X during development, and partnering to test which altitudes are best suited to specific crops. The natural gas transmission system in the US is comprised of roughly 250,000 miles of pipeline. As new pipeline construction becomes more difficult there is growing emphasis on inspecting and maintaining existing infrastructure to increase its reliability and safety. Aircraft are routinely employed to survey natural gas transmission pipelines for leaks or damage. Airborne sensors detect methane or hydrocarbon plumes around a pipeline indicating a leak. GPS and on-board mapping software record the plume’s location and intensity for reporting and repair. There are generally two types of sensors; those that sample the air as the aircraft moves through a plume, and those that sense a plume at a standoff distance using IR or laser spectrometry. The sampling sensors measure gasses in the air directly and are reliable but require the operator to fly through a plume to detect it. The standoff sensors detect a plume from a distance, but can be affected by background noise or environmental conditions. Both types of sensors benefit from low altitudes and speeds. Airplanes only carry standoff sensors, as their flight altitudes are not ideal for sampling sensors. Helicopters can carry either type of sensor – to as low as 25-50 feet in places, but are more expensive to operate then airplanes. 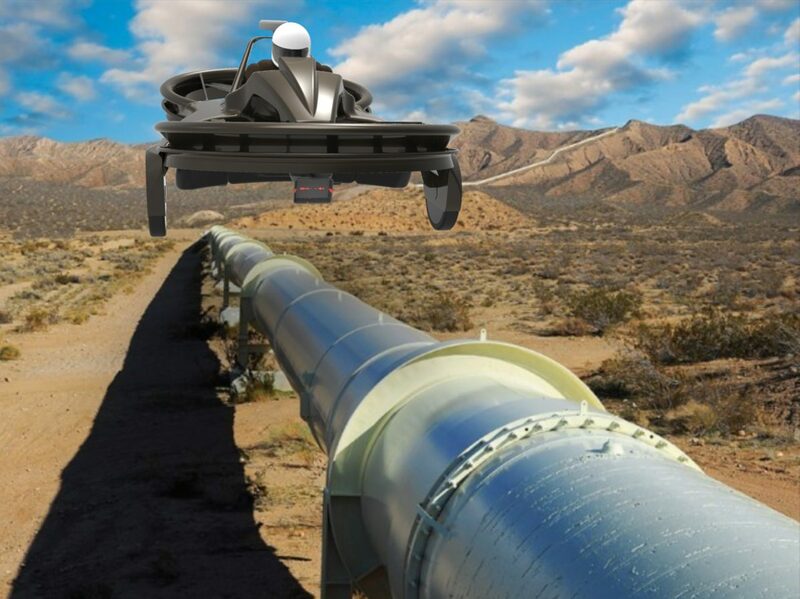 The Aero-X would provide a cost-effective alternative to these aircraft for pipeline inspection in remote areas. It is well suited to host both sensors together as a suite to benefit from the advantages of each. In flight at moderate forward speed the Aero-X maintains a nose-down attitude that directs the downdraft rearward for lift and propulsion. Detectors mounted at the nose are clear of the downdraft and able to sample and look into an undisturbed plume. When a leak is detected, the vehicle’s small footprint and vertical landing capability enables the pilot to land and assess the damage, assuring the right tools can be brought in for repair. Aero-trekking is the exploration of a remote area at low altitude and speed in an ultralight aircraft. Aero-trekking became popular in 2005 in Arizona and New Mexico. The ultralight aircraft provides a platform for pilot-trekkers to aerially view topography barely accessible by other means. We love the concept and believe we can make it even more immersive. The key is a vertical take-off and landing (VTOL) craft that is thrilling to fly and can land almost anywhere – enabling explorers to interact with the worlds they encounter. The Aero-X is a tandem-duct VTOL craft with a compact footprint. It can set-down in small spaces or stop in the air and hover like a helicopter. Unlike a helicopter, it is not difficult to fly. Nor does it have exposed rotors, permitting maneuvers closer to obstacles. In the 1960’s the Piasecki Aircraft Corp. demonstrated these craft could fly within trees and over water. 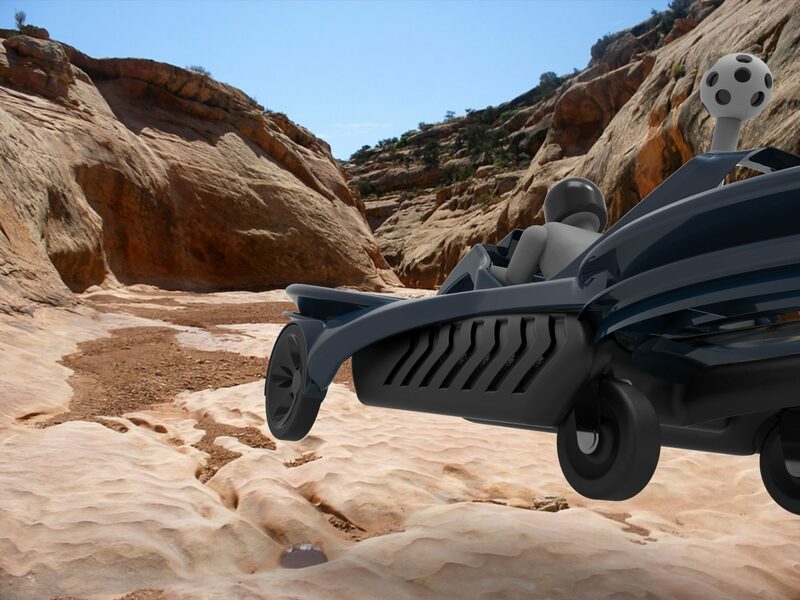 We’ve reinvented the platform and believe they’ll be exhilarating in valleys and canyons, or other undiscovered places inaccessible to traditional vehicles. 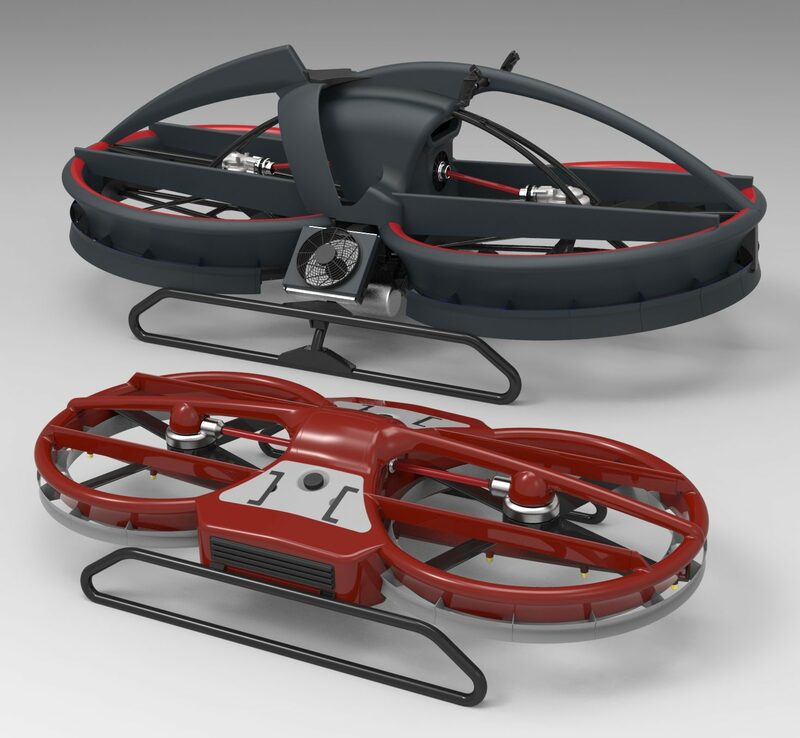 The same qualities that make the Aero-X an attractive platform for exploration apply to aerial surveying and study. Surveying by air covers more area in a shorter time than can be achieved with ground vehicles or trekking on foot. The higher speeds of fixed-wing aircraft however, do not permit the level of photographic detail and accuracy of measurement achievable with a VTOL craft capable of slow close-in flight. Whether flying with a passenger or in groups, or with auxiliary tanks for extended treks, the Aero-X will bring a new dimension to discovering the natural world around us. And when it’s time to study or document what we’ve found, the Aero-X will provide aerial utility in hard to reach places.